Today in the Bay's Laura Garcia and Marcus Washington kick off Clear the Shelters 2017 at Berkeley Humane. 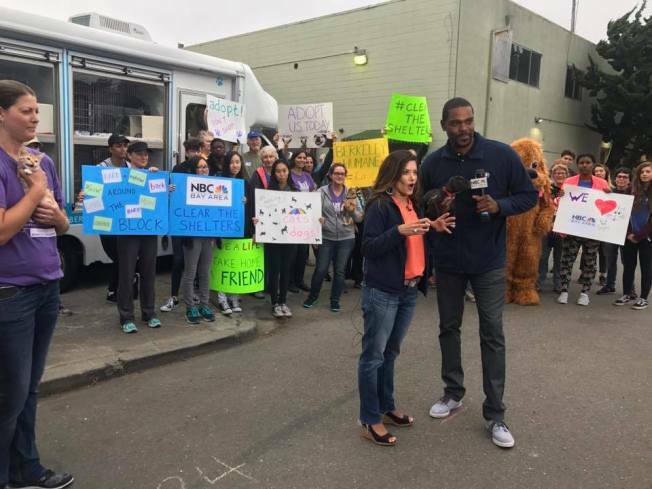 NBC Bay Area invites all Bay Area animal shelters and rescue groups to join us on this year's Clear the Shelters! Hundreds of shelters across the country are teaming up with NBC Owned Television Stations and Telemundo for this nation-wide pet adoption drive on Saturday, August 18 that helps find loving homes for animals in need. Participating shelters will offer waived or reduced adoption fees. Last year was our biggest year yet, with more than 5,000 pet adoptions in the Bay Area alone throughout our month-long push, more than 80,000 pet adoptions nationwide! We hope you will join us this year to make Clear the Shelters a resounding success. The support we received from participating animal shelters and rescue groups, who offered families the opportunity to adopt an animal in need by offering no-cost or reduced fee adoptions, or waiving pet spaying and neutering fees, helped us make Clear the Shelters a nationwide movement!